Marriages, they say, are made in heaven. Being one of the most special moments of one’s life, one always looks forward to having a wedding that one can truly cherish forever. Although a number of new concepts centred around wedding ceremonies have cropped up in the recent past, the grandeur of having a traditional Indian wedding still remains unparalleled. Non Resident Indians, we are sure, can instantly connect with the emotional aspect of making the most important day of their lives memorable by tying the knot in tradition. After all, exchanging nuptial vows at the place where your roots are is indeed divine and that leaves those special moments etched on to your memories forever. What Makes India The perfect Place For An NRI Wedding? The very concept of an NRI wedding is to take your vows amidst the holy chanting of verses and feel the Gods showering their blessings for a blissful matrimony. India being the land of gods is the only place where such a matrimonial alliance can materialize. India and its neighbouring nations that share a common culture are bequeathed with plenty of picturesque locations that are absolutely breath-taking and are sure to make your wedding all the more special. Since most of the NRIs tend to have an emotional connect with their homeland i.e. India, an NRI Wedding can make them feel close to their roots for India is where their heart belongs. People from across very many diverse cultures around the world acknowledge the fact that the traditional Indian wedding attire of the bride as well as the groom, feels nothing short of royalty. Authentic Indian cuisines are mouth-watering. Only in a wedding taking place in India can one afford the privilege of ticking one’s taste buds with lip smacking original Indian food. All your guests are sure to relish such delicacies. Dance and sangeet are the centre of attraction in traditional Indian weddings. Being a part of such an extravaganza, every NRI is sure to witness a gala time in India. Having a wedding in India is pretty affordable vis-à-vis having one in other parts of the world. Affordability is, therefore, one major factor that makes India the perfect NRI wedding destination. 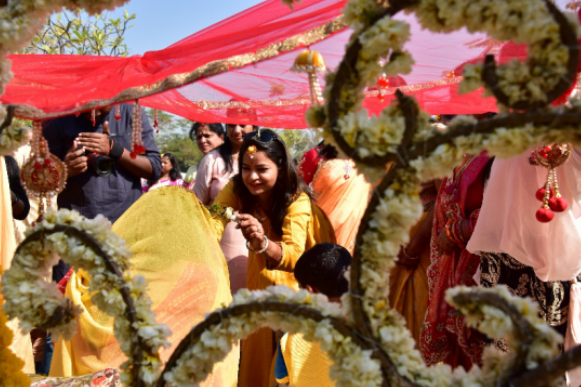 Successful planning and organizing a wedding ceremony in and around India is nothing short of a challenge, it is, therefore, prudent to consider availing the services of an experienced wedding planner. Known for turning everyone’s wedding dreams into reality, WhiteWaterEvents has to its credit a number of stories of successful Indian weddings. The experts at WhiteWaterEvents meticulously chalk out a work plan that takes care of every minute detail. Right from organizing of the event to its actual implementation, WhiteWaterEvents takes away all hassles and worries that are sure to be faced by anyone planning a traditional Indian wedding. The services offered by WhiteWaterEvents entail everything that comes under the ambit of Indian weddings. From getting the perfect wedding spot booked for you to catering to the taste buds of all the invitees, WhiteWaterEvents takes care of it all. Ensuring a comfortable stay for all the relatives and the invitees is high on our priority list. The traditional ‘Band Baja Baraat’ is an integral part of every Indian wedding and we at WhiteWaterEvents make sure that the most pompous Gaaja-Baaja and Dhol adorn your wedding. The planners at WhiteWaterEvents are renowned to come up with the most unique décor and theme for every wedding. In a nutshell, WhiteWaterEvents takes care of all the worries and ensures that you enjoy an absolutely hassle-free Indian wedding amongst all pomp and splendour. For all those NRIs wishing to make their wedding day memorable, we would like to mention that WhiteWaterEvents is always at your service and just a call away.